Macbeth was in the fortunate position of not being able to sleep most nights, something the juvenile adolescents of Elm Street could only hope for. The dream world for these unfortunate souls is inhabited by a fedora wearing dream stalker, scratching around in the deepest recesses of the slumbering mind, ready to tear and claw his way through the amorous pulp of youthful fantasies and outward into the real world. 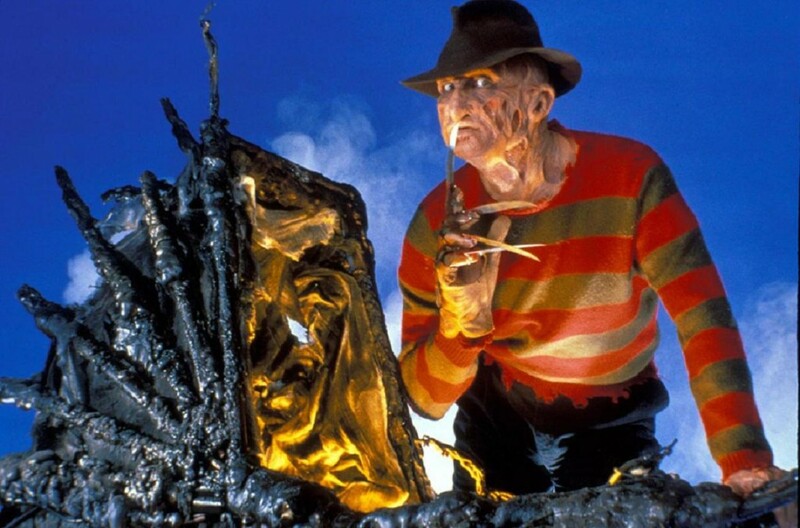 Frederick Charles Krueger, or “Freddy” Krueger to his demonic amigos, was a child killer who, after evading the law, eventually succumbs to a local mob of concerned parents, and burnt alive in a boiler room. Although his body was entirely possessed by the flames, his spirit lived on in the youths of Elm Street and he exacts his revenge accordingly from within. His legend has been twisted and moulded throughout the years, and sometimes morphs into a wisecracking evil uncle, clownishly popping out of the shadows to dance and slash his way, along the supple teenaged landscapes of the dream world. 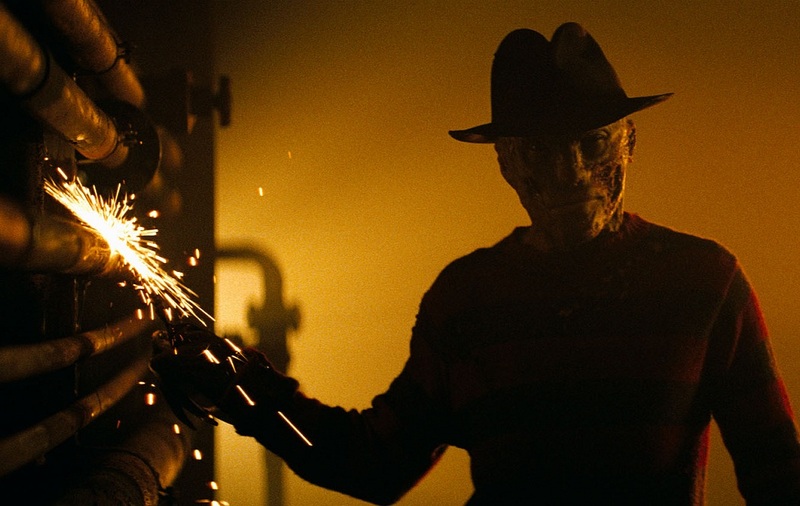 Dredged from the mind of Wes Craven and a childhood incident involving a ghastly encounter with a hideous vagrant, the sinister character of Freddy was born and from there a franchise grew. Freddy is now standing tall with Jason and Michael Myers as the main maiming behemoths of cinema. The following is a list of the entire Nightmare on Elm Street series ranked worst to best. Platinum Dunes, a factory that churns out unnecessary remakes of classic horror movies, now turns its grubby attention to dear old Freddy Krueger. And in removing Robert Englund from underneath the shabby fedora, they have committed a sacrilege on a scale that only removing Laurel from Hardy or having any actor other than Charlie Chaplin playing the Tramp, could possibly top. The plot is the same as the original, Nancy (now played by Rooney Mara) is having her beauty sleep selfishly disrupted by a burned up evil presence with long sharp fingers, so too are her friends (yes, the obligatory group of faceless, characterless invisibles, prime meat for a dream psycho slasher). They start dying one by one, and Nancy has to not fall asleep whilst solving the mystery of Fred Krueger and his reasons for slicing all her friends up. Jackie Earle Haley is the new Freddy. 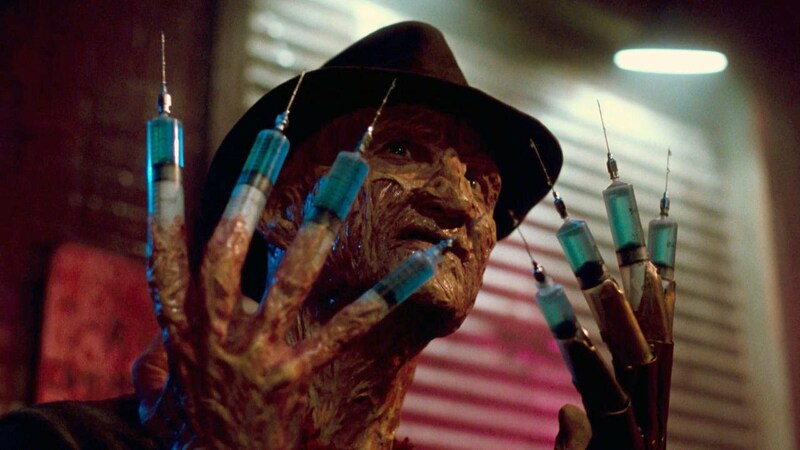 In another lifetime, in another bad dream, he would’ve worked just fine as the evil child killer/molester, the film does try to make a real bogeyman out of Freddy, rather than a joke telling stand up comedian, but his performance doesn’t stand up to Englund’s, with added CGI updating the look for modern tastes, but losing its charm, creating another weak remake, lost in a pallid sea of other useless reboots of other franchises, all aimlessly afloat, each one hoping to sink to the cloudy, ink black depths and disappear without a trace. If Michael Bay (the producer of this…uh…nightmare) sleeps soundly at night with no knife fingered demon haunting him, then the world is a crueller place than initially thought. “You can’t scare me anymore” well Tracy (Lezlie Deane), Freddy stopped scaring the viewing public shortly after the first movie ended. The makers of the sequels intent on making him a malevolent old man bursting with bad jokes than a menacing child molester and hunter of dreams, this film stretches the comic Freddy to its absolute end. If the makers of Airplane lost their ability to write humour and decided to do a Nightmare on Elm Street film, it would look a lot like this. Opening with not too subtle back to back references to The Twilight Zone and The Wizard of Oz, we see that Freddy has now eliminated every child in the town of Springwood, except for one surviving teen named “John Doe” (Shon Greenblatt) who suffers from the usual nightmares. There’s the same group of teens (although slightly more troubled, and with more inept actors, than previous adolescents in the series) with their same old attitudes in the same old town (it makes no difference that Freddy has upped sticks from Elm Street, it’s all the same at this stage) who get picked off one by one by one. Totally reliant on mugging cameos (Alice Cooper as Freddy’s abusive father is, admittedly a master stroke of casting) and strange humour, this is the nadir of the series, the dreams, normally the high point even in the franchises lowest moments, are tired and lacking the sadistic tones and even the imagination needed for a good shock (the best dream scene involving a deaf character experiencing all sorts of ill sounding, cacophonous horrors). It takes the silliest element from the previous film (the comic book sequence) and makes a whole film, unfortunately, in that vein. Freddy sums it up “You forgot where you came from, kid… but I know where you’re going.” Onto a much needed rethink, a few years off, and a much better sequel it seems. To mess with the rules of a character (and what made the first film so fresh and brilliant) by only the second entry into a series is brave, but quite foolish. In the first, Freddy existed and did his hellish deeds whilst encased in dreams. Nightmare on Elm Street 2 has Freddy stalking the real world as well as the dream world, therefore making the evil goings on in the first film somewhat redundant. Jesse (Mark Patton) is having nightmares about a very familiar scalded killer after his rather strange family move into the former home of the Thompson family (Nancy and her mother from Nightmare 1). She has kindly left her diary lying around for Jesse to stumble upon and finds his dreams are quite similar to the ones Nancy was having. What follows, as Freddy slowly takes possession of the emotionally fragile Jesse, is a nonsensical addition to the franchise, with a slight exploration into poor Jesse’s sexual leanings and Freddy’s manipulation of him which includes some catastrophically bad effects set pieces, including the detonation of his pet birds, and some hilarious human headed dogs, its only saving grace being Freddy’s bursting forth from Jesse’s chest and taking a step out into the world to slaughter Jesse’s friend Grady. But unfortunately this doesn’t save it. Best for Freddy to stay firmly hidden inside Jesse’s flimsy human tomb, until something more worthwhile comes along. Or…Freddy Krueger Meets Rosemary’s Baby. Alice, the Dream Master from Part 4 has now been impregnated (in a trying too hard to be arty opening title scene of moodily lit copulation) by her woeful jock boyfriend Dan, and with their lives now seemingly Freddy-less and perfect, she starts having strange, strange dreams. Now there’s another group of cardboard cut out teens and Freddy wants to dispose of them, but he can’t quite possess our Alice so he settles for her unborn child, hoping to use it to return to the real world. Dan, thankfully, doesn’t last long enough to see the fruit of his loins, and it’s down to Alice to make sure Freddy is permanently locked out of reality. Whilst Freddy is at his cartoonish best, literally, in the comic book sequence (a cross between the suspenseful Paperhouse (1988) and A-ha’s Take on Me music video), the real menace are the parents (Greta’s controlling Cruella de Vil like mother) and there’s the obvious message of teen pregnancy lurking in this new twist to the series. The film attempts, but somewhat fails to add a darker tone to the sections between the outrageous dreams, gathering scraps of Freddy’s past up and trying to formulate a worthwhile story, which the paying public didn’t quite appreciate (this was the 2nd lowest grossing Nightmare film). Sadly, the only thing born of this film was another bad sequel.